Drummer/composer Eric Harland is a thrilling musician. His work with Charles Lloyd, Dave Holland, the cooperative quartet James Farm, Wayne Shorter, Esperanza Spalding and so many more is a tribute to his creativity as not only a timekeeper but as a time-expander. His group, not surprisingly, is dubbed Voyager and features Walter Smith III (saxophones), Taylor Eigsti (piano), Julian Lage (guitar) and Harish Raghavan (bass) - the music this band creates crosses many genres and does so forcefully yet with a certain amount of grace. "Vipassana" (GSI Records) is the group's 2nd CD ("Live By Night" came out in 2011), expanding on the earlier effort by not only adding Chris Turner (vocals) and Nir Felder (guitar) but also going in new directions. Turner, who has performed with Ms. Spalding, Bilal, and ERIMAJ, has a handsome, soulful, voice and, at times, his work here is reminiscent of Marvin Gaye from "What's Going On" (and beyond) with its layered sound. One hears that on the opening track, "Relax" with the lines "You don't need to worry/just relax your mind" coming at the listener from various points in the sound spectrum and serving as an invitation into the music. Turner does not appear on every cut but is a welcome addition. His sweet tenor and falsetto float and moan behind the funky drums on "Passana" then becomes a lovely choir (and the only other musician) behind the electric guitar on "Greene" (perhaps a tribute to saxophonist Jimmy Greene). His voice soars above Felder's raucous and Lage's comforting acoustic guitars on the ballad, "Normal" and becomes a playful foil to the super-funky chunky rhythms on "Dhyana" that closes the program (a track that suggest Sly Stone, Robert Glasper, and Nile Rodgers). The long fade on the latter tune, with the piano solo rolling over the guitar, bass and drums, could have gone on for another 4-5 minutes, the groove is so infectious. The group's arrangement of Herbie Hancock's "Maiden Voyage" is a wonderful reminder of the forward motion of creative music, changing the rhythm and creating a hypnotic background for the exciting work of Eigsti (the use of guitar and tenor sax as foundation is impressive as is restraint of the rhythm section. On "VI", the pianist creates an impressionistic solo over strings (synthesized?) and Turner's voice ping-ponging while Harland plays a simple beat. Smith III rises out of the mesmerizing background on "Eminence" with a soulful melody/improvisation built off the piano chords, paving the way for Lage's short but o-so-sweet solo. The energy of the saxophonist's duet with the drums draws the listener into"Singularis", setting the stage for excellent interaction and strong piano and saxophone solos. If possible, one should listen to "Vipassana" all the way through (anybody do that anymore?) - at 50 minutes, the music moves by quickly yet there are times so much is happening and there is such pleasure in letting the music wash over and through you. Eric Harland Voyager is very much a group, not a side project. The soulfulness and energy of this music plus the excellent contributions of Chris Turner is a joyful addition to one's days and nights. For more information, go to www.ericharland.com. Among the highlights is the ultra-funky reading of "A Closer Walk With Thee" featuring Henriquez and Jackson in support of the sweet Hammond organ work of Shedrick Mitchell. Trombonist Gardner join those 3 musicians for the heartfelt Jackson original "Praise", a tribute to the store front churches saw in the Detroit of his youth. The buoyant bass line and robust tambourine work of the leader puts the listener in the front pew. The longest track (6:27), both the trombonist and organist get to stretch out. Tenor saxophonist and fellow Detroiter, J.D. Allen, is featured on the quiet ballad "I Love You" along with the excellent piano work of Eldar Djangirov (who also appears on Allen's 2 recent HighNote CDs). Jackson's cymbals create a subdued rhythmic backdrop for the soloists. The saxophonist also appears on "Fee Fi Fo Fum", the Wayne Shorter tune recorded on Christmas Eve 1964 with a quintet and released on the Blue Note Lp "Speak No Evil." Here, it is a blues influenced by Sonny Rollins' "Freedom Suite" trio with Jackson's mentor Max Roach. Bassist Omer Avital appears on 2 tracks as well, the CD opener "Ali Got Rhythm" (featuring Yes! Trio mate Aaron Goldberg on piano) and the country-blues ballad "Kentucky Girl", played here as a duo. Avital's deep notes resonate over the sharp sounds of the drum kit and tambourine. LCJO associate Ted Nash flashes his excellent alto sax on the CD closer, "Inner Urge." Bassist Henriquez gets the first solo, a mighty impressive display of melodic and rhythmic elements. When Nash steps in, the rhythm section really begins to propel the piece forward and the saxophonist flies high over them. Jackson's solo anticipates the return of the melody - he even plays the theme alongside Nash as the piece (and CD) comes to its sparkling close. Ali Jackson is a player who loves his gig and never gets caught up in simply "showing off his stuff." "Amalgamations" shows he is as adept at feeding the fire beneath small ensembles as he is at being the primary thrust rockets for the Lincoln Center Jazz Orchestra. There is a warmth to the sound of this album; you can really hear what Jackson and the bassists (Phillip Keuhn also appears on 2 tracks) are playing. Give a listen and you'll like what you hear! For more information, go to www.alidrums.com. Drummer/composer Phil Haynes (Free Country, Paul Smoker, Gebhard Ullmann) organized his new trio - known as No Fast Food - around David Liebman (flutes, tenor sax, soprano sax) and his long-time collaborator Drew Gress (bass). As someone who first was introduced to creative music in the late 1960s and early 1970s by seeing and hearing Wadada Leo Smith, Julius Hemphill, and Trio Air (Henry Threadgill, Fred Hopkins and Steve McCall) among others, the music one hears on "In Concert" (CornerStoreJazz) hearkens back to those nights in airless concert spaces or large churches, when the music would cut right through the listener, bounce off the walls, shock, soothe, and challenge everyone in the audience. The 2-CD set was recorded over 2 nights (9/06 & 08/2012), one in the Bop Shop (Rochester, NY), the other in the Elk Creek Cafe (Millheim, PA). Gress's full, thick, tones mesh well with Haynes' expansive use of his trap set. As "free" as it seems at times, this music rarely feels noisy. There are moments, especially on "Incantation", that the music feels more like praying. Isn't that what the blues, a prayer, calling out to the Lord for release? One hears that in Leibman's heartfelt soprano solo on "Blues for Israel" and his tenor statements on "Last Dance." The fine mallet work and the counterpoint from Gress on the latter track stand out. The way this Trio manipulates rhythms is impressive throughout. "West Virginia Blues" combines a hearty walking bass with pounding drums while the tenor solo seems to be in 1/2-time. And, after the bass solo, the trio emulates Sonny Rollins' "Way Out West" for a brief moment before moving on. There are numerous playful moments, most noticeably on "The Code", where the theme seems to built upon a game of hide-and-seek. During the drum solo, the bass dips in and out, then Gress and Leibman conduct a feisty conversation (especially the tenor) - the drummer returns and the conversation gets a bit more agitated leading to Leibman's a cappella moment. The Air connection really stands out, for me, on "Ballad du Jour" especially the interplay of the bass and drums as well as the "open" quality of the tenor solo. 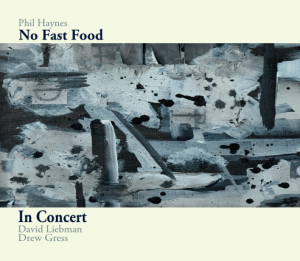 "No Fast Food" is a fine credo to live by and, in the case of Phil Haynes, a splendid showcase for both his compositions and his relationship with Drew Gress and David Leibman. This is "live" music that deserves to be heard live. Until that happens, take a deep breath and dive into this 100-minute ocean of sounds. For more information, go to www.philhaynes.com.